Fender’s bid to beat Gibson at their own game yielded an innovative and arguably underrated humbucker that some believe is the most versatile around. Guitarists have been lining up on either side of the Gibson/Fender divide in guitar culture, wallets in hand, ever since the companies became leading competitors in the solidbody electric market in the 1950s. Although neither brand would be able to claim dominance in the hard rock world, during the late 1960s and early 70s, Gibson’s humbucker-equipped instruments were proving to be a popular choice for guitarists looking for a thicker, chunkier guitar tone. This trend was not lost on Fender. 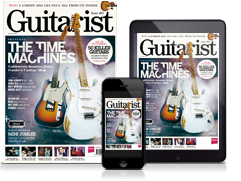 The comparatively thinner, percussive quality of their single coil pickups just wasn’t doing it for many guitar players and heavy rock did not appear to be getting any less popular. In a shrewd and calculated move Fender drafted the inventor of Gibson’s humbucker, Seth Lover, to take care of business, and in 1970 the Wide Range Humbucker was born. 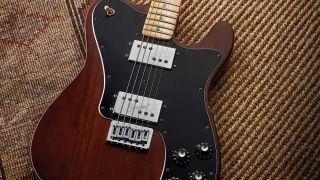 Its arrival was heralded by the unveiling of Fender’s second-generation Telecaster Thinline, Custom and Deluxe models in 1971 and 1972, followed by the Starcaster in 1976. This unique, fully adjustable, highoutput dual coil design utilised 12 CuNiFe (copper/nickel/iron) alloy magnets, wound to 10,000 turns with 42-gauge polysol wire, producing a whopping inductance of 4.85H and a DC resistance of 10.6 kilo-ohms. The original Wide Range humbucker is truly a child of the 70s and will remain so, as its production ceased in 1979. Although subsequent reissues have taken the original Seth Lover blueprint into account, many aficionados believe the seminal design to be unrepeatable due to the extreme scarcity of the CuNiFe alloy rods used to manufacture the polepieces. As a result, supply and demand has pushed the price of original Wide Range humbuckers upwards on the vintage market, with some examples selling for over £300 each. Fortunately, however, there are options available that mean you don’t have to buy the best part of an entire Fender ’72 Telecaster Deluxe reissue guitar. Pickup specialist Jaime Campbell of The Creamery in Manchester has taken matters into his own hands and has created a selection of Wide Range-style humbuckers to meet the demands of the discerning guitarist looking to explore the design’s unique sonic charms. “Wide Range Humbuckers are my favourite pickup of all time,” says Jaime. “They have a clearer and more defined sound than the traditional PAF-style humbucker. When I was at university, I used to put on bands with Alex Kapranos of Franz Ferdinand; he’s renowned for using Wide Range Humbuckers and [The Creamery] started from a conversation we were having about recreating them. “When Franz Ferdinand came onto the scene, very few people were playing 70s Fenders. Traditional Teles have always been popular, but the Deluxe and the Customs with Wide Range Humbuckers generally weren’t. When people started seeing bands like Franz Ferdinand and Coldplay using them, the Wide Range humbucker suddenly became popular. “One thing I love about the original Wide Range Humbucker, which I incorporate into my designs, is the idea of having individual threaded magnets in the pickup. It allows you to individually height-adjust each magnet, which acts as a rudimentary EQ for each string, and because they’re individual magnets (as opposed to the Gibson-style bar magnet design) it gives a clearer, more defined sound that still cancels hum. “It’s a more muscular, jangly, indie kind of sound. It’s slightly overwound, so it’s hotter, yet it seems brighter. They’re great for using with effects pedals - especially for shoegaze bands or bands who really want to layer effects and use lots of gain and fuzz, without getting a very heavily saturated metal sound. That’s where the crunchiness of the Wide Range Humbucker really comes to the fore.